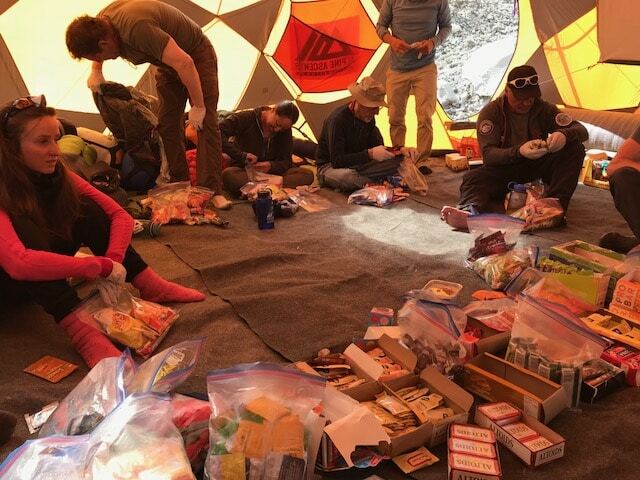 Planning and packing food for long trips in the backcountry can be challenging and time consuming – but the last thing you want is to eat energy bars for 6 days straight. Climbers need to consider several important factors: weight, cook-time, variety, and deliciousness. The following information should set you on your way toward becoming a Michelin Starred backcountry chef in no time. Eating during and after strenuous exercise, especially at high altitudes, can be a challenge for anyone. You can easily alleviate some of these challenges by choosing a variety of foods that you enjoy eating on a regular basis. Try to choose calorie-dense items with plenty of protein and healthy fats (less sugar), but don’t forget your favorite hard candies, candy bars, and energy foods. You will need to keep your body fueled with calories and electrolytes throughout active climbing days, and this often requires eating or snacking when you’re not hungry and at times you’re not used to eating. Finding a middle ground between weight and flavor is the key to enjoying backcountry cooking. The longer your trip is, the stricter you should be about minimizing your food weight. Focus your meal planning on foods that have a minimal amount of liquid weight – items like canned foods and liquid sauces should typically be avoided. Alternatively, pre-packaged, freeze-dried meals are a convenient way to minimize weight for longer trips, but fresh foods are generally much tastier and can be whipped up without absurd effort if you do some simple prep work before heading into the field. Despite the convenience, light weight, and ideal cook-time, it’s best to avoid relying solely on freeze-dried meals for climbing trips longer than two to three days. To add some variety into your meals without adding too much extra weight, consider starting with some of the following mountaineering staples: dried soup mixes, dried potatoes, dried milk (for granola), dried pesto, dried spaghetti sauce, and dried refried beans. Before heading into the mountains, you should repackage your meals to reduce the weight you will be carrying up and the waste you will be carrying down. You will also want to ensure your meals are well organized and packaged securely. On a shorter climb, you might consider chopping up onions, peppers, and mushrooms before heading into the field – this will minimize food waste in the field. Packing all your vegetables in the same bag with any desired spices will reduce waste further – double bagging will help avoid any leaks. All you have left is to sauté your veggies in a little olive oil and add them to the rest of your meal. Choose meals that cook quickly to reduce space and weight from extra fuel. The difference in fuel usage between a fifteen-minute meal and a three-minute meal is substantial over the course of a few days, so be picky with your ingredients. Pastas and grains seem to cook quickly at home, but there are usually quicker options available. Meals like couscous, plain ramen noodles, instant oatmeal, and instant grits are some good examples of quick-cooking foods. All you need to do for these handy meals is add boiling water to your ingredients, cover, and let sit for a few minutes time – then add sauces, spices, and toppings as desired. There are some times when it makes sense to go a bit heavy with your food-pack. Camp Muir, on Mt Rainier, is one of them. Breakfast is a critical meal for starting your day off with an energy boost, and it is always worth throwing in some variety for longer trips. Even if you end up choosing just a few different meal options, remember that toppings are your friend! Dried fruits and nuts such as blueberries and cashews will make oatmeal more palatable than your standard brown sugar and cinnamon. Hash browns, pancakes, eggs, and bacon are all within reason for days around basecamp, while quick cooking oats, grits, granola, breakfast bars, and pop-tarts are great for summit days and early morning starts. Mountaineers and alpinists often say, “lunch starts right after breakfast and ends just before dinner”. This saying is certainly applicable to big climbing days and summit pushes, during which you should plan to eat a small snack at every break, but there are plenty of times when a “normal” lunch is in order. For approach days or days spent around camp, bring a pre-made lunch or some leftovers from your fridge. Sandwiches are easy to make and easy to eat on the go, so they are my top pick for lunch. Cut sandwiches in half for more active days and consider using bagels as a base to decrease the crumble factor. Supplement your lunches with extra snacks and other quick, on-the-go foods like pretzels, dried fruit, or mixed nuts. Fueling at regular intervals will enable you to keep moving uphill and stay focused over the course of a long approach or summit day. A variety of handy, palatable snacks might be one of the best tools a climber can have in their food toolkit. Choose a variety of granola bars, energy snacks, and your favorite everyday snacks that are easy to pack and eat on the go. In general, most of these items end up being processed in one way or another, but mixed nuts, trail mix, and dried fruit are a few nice alternatives. Dinner is often a social hour in mountaineering, as most of the work for the day is behind you. You’ll be dining with five-star views and good company, so it may just be worth the effort to prepare food to match. This is where your creativity really comes in handy. You can usually start with a quick-cooking staple carb like couscous, plain ramen, or rice noodles. Add a variety of dried sauces, spices, veggies, nuts, and meats to build a gourmet Spaghetti Bolognese or Pad Thai dish. Treat yourself! Bring something delicious, and you’ll be happy you did. You do not want to be the only climber without dessert, do you? When I was out skiing a few years back, I went off a jump and landed flat on my backpack – my camera was inside, so I quickly opened it up to see if anything was broken. The camera was in-tact, but the banana I packed for lunch had been smashed into every nook and cranny of the camera. Bananas smash, crackers crumble, and apples freeze – take the extra time to consider how well your food will travel in the backcountry. Somehow, I avoided the low hanging fruit, and this post is completely devoid of food puns… You’re welcome. We cannoli hope this continues for part two of our blog series where we will further break down the food planning process into individual trips and meals.